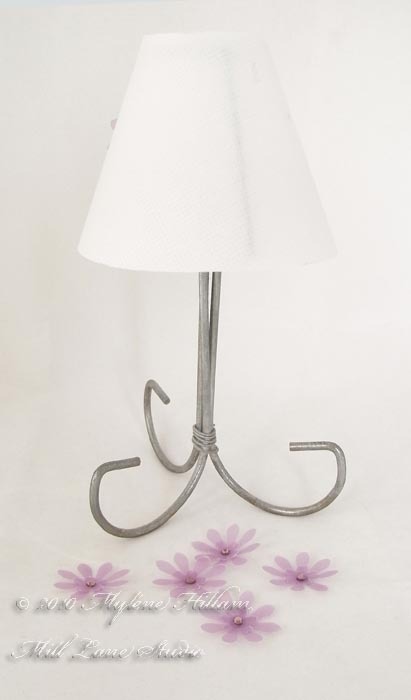 Here's an easy project that came about because of a little mishap. 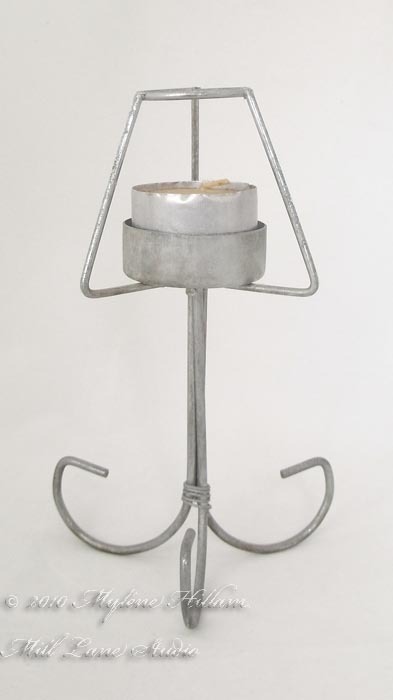 This cute little glass tea light holder came to grief when the breeze picked up one warm day last week and knocked it off the sideboard and onto the tiled floor.... smaaaash. And that was the end of the glass cover. No great disaster though because it was a cheap pick up from the Two Dollar shop. 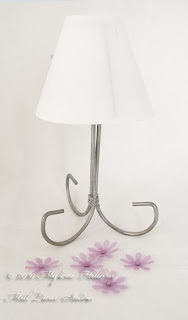 So today's project is to make a simple, but pretty replacement. 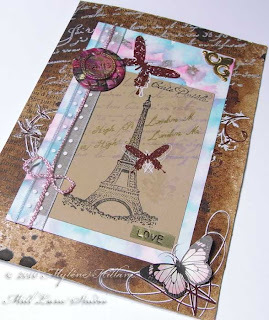 I've gathered together some vellum, flat back crystals and a couple of flower punches. Oh, and adhesive! Don't forget the vellum adhesive because it won't show through. Firstly, trace a pattern for the cover. 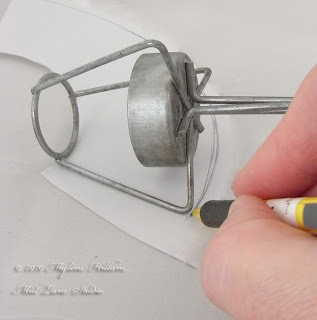 Do this by placing one of the struts along the edge of a piece of scrap paper. Roll the frame around the paper tracing the outline as you go. Do this for the top and the bottom. This will be much easier to do if your cover is still in tact and not in a dozen pieces like mine. Next, trace it on to vellum. 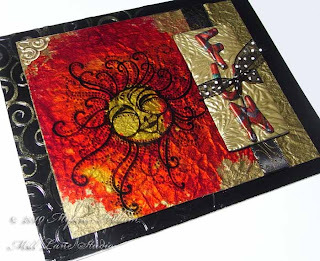 Cut it out and use vellum tape to tape the edges together. Punch out as many flowers as you need to decorate the shade. Layer the small flowers inside the large ones and add a pretty crystal for the centre. 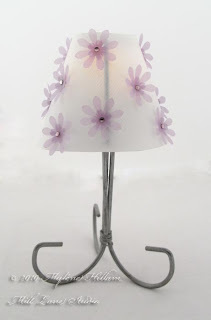 Attach the assembled flowers to the shade and voilà! A simple but pretty replacement shade. Notice the faint yellow glow? 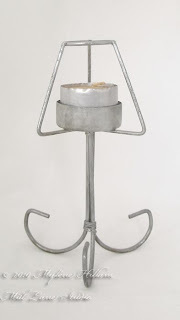 No, it's not a tea light..... it's a battery operated fake. It even flickers like a real tea light. Illuminating! I'm on a mission at the moment to come up with a number of different Friendly Plastic tutorials which are all aimed at the complete novice. It's a challenge to come up with very simple projects that have real impact, but this project is even more of a challenge because it also has to be translated into French. The projects can also only be made using items you most likely have at home in your kitchen already (so no craft tools permitted) and I can only use the oven method for softening the plastic. OK, this is definitely a challenge but it has certainly made me more resourceful. The projects are coming together quite nicely but along the way I also created a project that was just a little bit too difficult for the complete beginner so I want to share it with you. This idea seemed so simple at first but by the time I actually started doing it, it became quite apparent that it was too difficult for a first timer. But for those of you more advanced Friendly Plastic addicts, this is for you. Just follow the instructions below to create your own nifty little napkin ring using items you most likely have at home already. Measure the circumference of the spice jar and cut the Friendly Plastic approximately 1.5cm (9/16") less than this measurement. Brush the aluminium foil with a light coating of cooking oil. This will prevent the Friendly Plastic from sticking. Place the Friendly Plastic on the foil and place the tray into the oven for approximately 5 minutes. Whilst the Friendly Plastic is softening in the oven, lightly oil another piece of aluminium foil and place it on a firm surface. 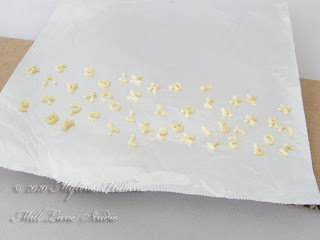 Spread the alphabet pasta out over an area that is wider and longer than the stick of Friendly Plastic. 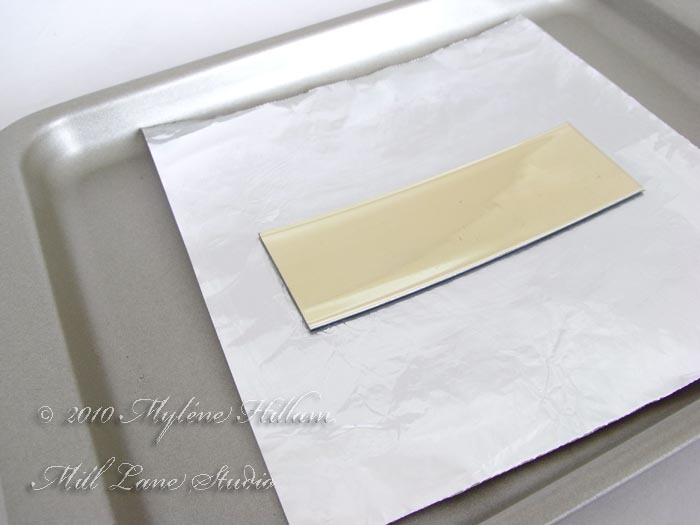 Once the Friendly Plastic has softened remove the tray from the oven and place it on a heatproof surface. Pick up the foil from the tray, turn it over and place it face down on top of the alphabet pasta. Gently roll over the foil with the rolling pin to press the alphabet letters into the Friendly Plastic. 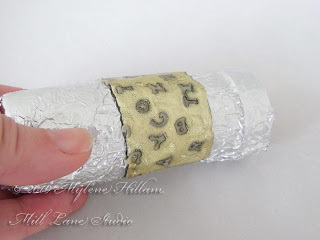 Wrap the two pieces of foil around the spice jar, trying to align the edges so they will be straight. You might crinkle the foil a bit in the step but it will add to the texture of the piece. 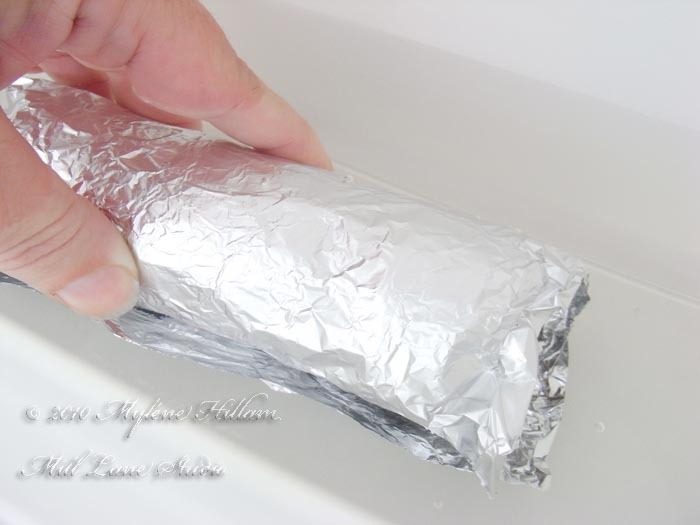 Plunge the foil and bottle into cold water to cool for about a minute or so. 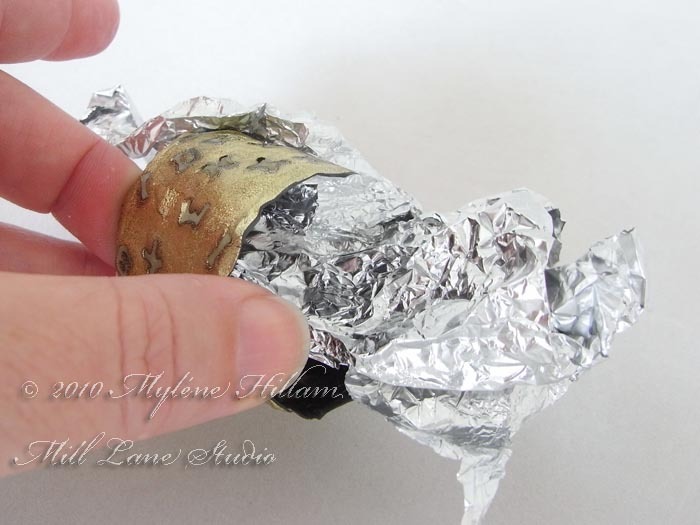 Unwrap the foil and gently peel away the outer layer. 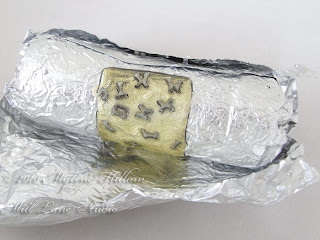 Gently pull the foil away from the inside trying not to leave any bits inside. And here's the finished napkin ring ready for you to coordinate with your table setting. I've pressed my letters in so that they're flush with the Friendly Plastic but if your letters are not quite as deep as mine, you might be able to carefully prise them out....... that's a really cool look too! 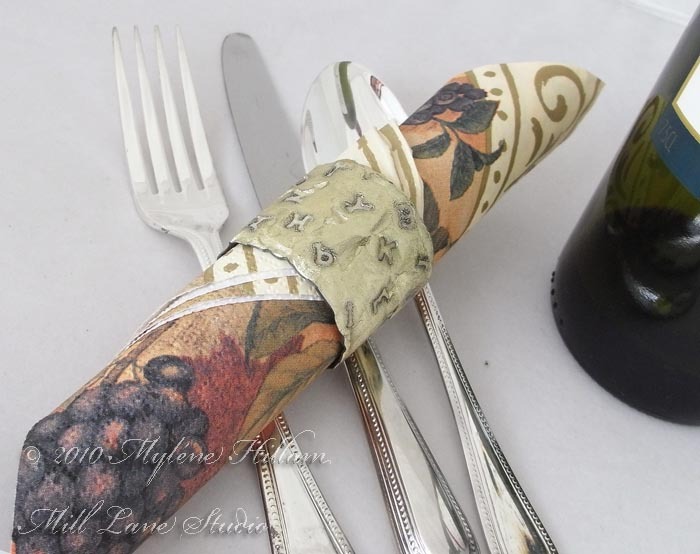 You can seal the napkin ring with resin to make it more durable if you like but that was not permitted in my challenge. 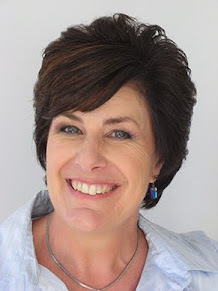 I hope you've enjoyed this fun little project and that you'll take the challenge to get resourceful and create something using only what you have on hand. 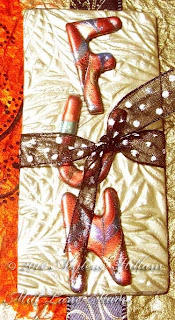 Have a happy crafty weekend everyone. The most wonderful things happen when you make mistakes. Earlier in the week I was telling you about how one of my ugly duckling resin castings turned into a beautiful swan, in the form of a necklace that both my daughters now want to lay claim to. 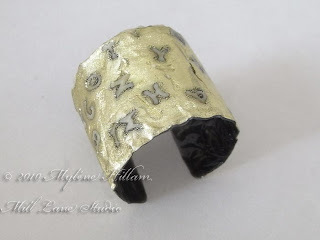 I was casting a resin bangle that I had coloured with Pearl pigment. It was really pretty in the bangle mould and I was very happy with the way it looked. But I had mixed a little more resin than I actually needed for the bangle and I had just enough left to pour a thin layer into each cavity of one of my favourite Krafty Lady art moulds, 5 Dominoes (AM245). I thought this beautiful pearl colour would make a great background with something embedded on top of it. But it was such a disappointment! The colour was so transparent that it completely lost its effect. So I set the casts aside for another day. And then it hit me.... why not take advantage of the transparency and add colour in layers so that they seem to be suspended in resin. I'm sure that this has been done before, but I suspect not with the colouring technique I've used. So I set about adding colour, layering resin, adding more colour and topping up with resin. It was quite a lengthy process but it worked a treat! 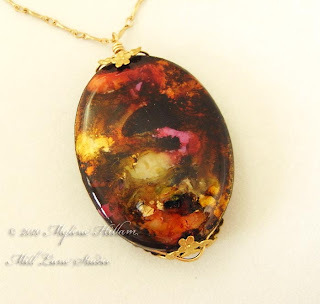 These resin pieces were now great bases to create some unique pieces of jewellery on. Take a look below to see them made up. 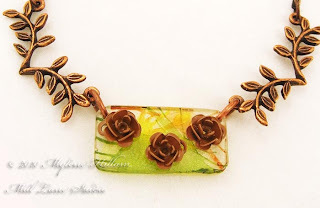 The first is put together with copper connectors from Nunn Designs and some sweet brown roses from Plaid's Petals a Plenty range which worked well with the garden tones of the resin piece. 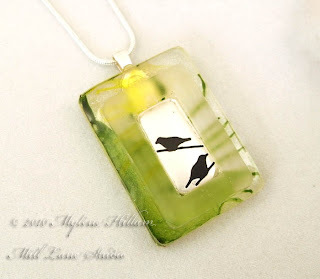 The second piece has a frosted glass frame around a silver bird charm (Plaid's Fresh range). 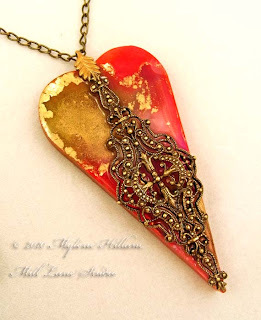 A simple chain finishes the pendant. I'm very happy with the results and I'm sure that at some stage in the future I'll create some more pieces using this technique. This weekend I'm off to the newest Craft Expo on the Brisbane craft calendar. It's run by the same people who put together the Brisbane Scrapbook and Papercraft Expo in June and anyone who has been to that show knows how good a show they put on. I'm sure I'll find an item or two to add to my craft stash so I'm looking forward to a wonderful day out! Where did the past two weeks go? The last time I looked it was a week before my DD's 21st birthday celebration and we were busy welcoming interstate visitors and enjoying much merriment and laughter whilst we all caught up with each others family life. I was also in the midst of catering for 70 party guests. I swear I only blinked and now I find it is a whole week after the event. Time certainly does have a habit of getting away! Whilst I am pretty crafty in the kitchen (please interpret that literally), I am also quite a capable cook, certainly not in the league of Master Chef, but more than competent when I put my mind to it. But never, ever, ever did I think I'd cater for 70 party guests. And I did it all whilst my brand new oven went on the blink. This was most inconvenient timing - right before I started cooking for the party! In the meantime, the weather was being unkind, with storms and gusty winds predicted for the party. There was a new deck yet to be finished, light fittings still to be installed and window coverings yet to be fitted. Our regular electrician had become so busy that he couldn't get here until after the party to install the lights. Hmph, this was all supposed to be finished weeks ago.... things were not going well! The oven repair man, kindly dropped everything to come to my rescue though. When he arrived he took a look at the oven (and hotplate which had both shorted out in a power outage) and with a Cheshire cat grin he delivered the news that the parts required to fix them had to be ordered and they would take a week! I could have cried and panic was beginning to set in... and it very nearly did, but somehow, we pieced together a plan and then we hatched it. We would hire a marquee and a floor because we are yet to complete all the gardens around the house courtesy of all the recent rain, and red mud does not go well with my white floor tiles! We also hired a commercial oven and I was back in business. I'd only lost three quarters of a day.... phew! We also engaged a new electrician who installed all the lights, and then almost all the blinds arrived with the exception of the most important ones - the ones for the guest rooms! Not to worry..... we could do no more about it. Anyway, the party went off without a hitch, the weather was generally pretty kind to us and the commercial oven gave great service... the food was wonderful, everyone really enjoyed themselves and the rest is now history. Relatives have returned to their respective homes interstate and life has returned to normal.... well, except for the oven, which is still on the blink. So dinner last night was at a local Lebanese restaurant - spiced lamb on skewers.... yumm! 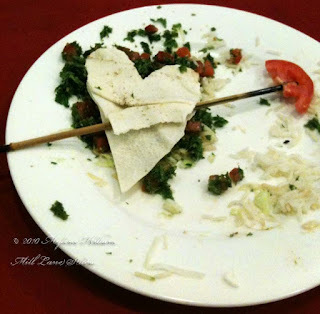 The food was so delicious but the serving was way more than I could eat so I got creative with the left overs - I hope the kitchen staff understood my thank you message. And tonight as I was preparing dinner, the microwave went out on strike too. But that's another story! Tomorrow it's back to the regular crafting schedule beginning with some of the resin pieces I've been working on lately. 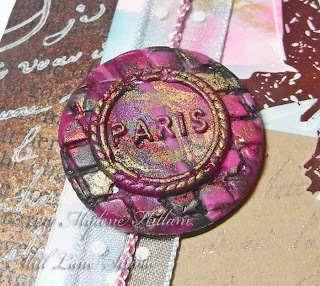 Here's another slight variation of the resin and Friendly Plastic pendant we'll be making in tomorrow's class at Stamp Antics. 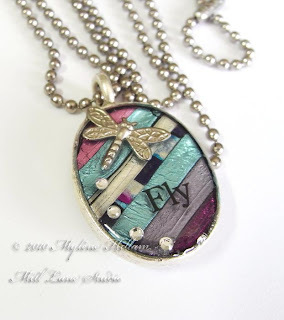 This promises to be a really fun class - making these little pendants is so addictive! If you were unable to get into the class I'm happy to say that there will be another one scheduled soon. 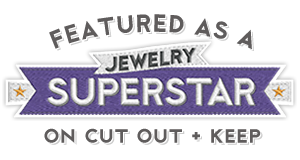 So why not give Jenny a ring at Stamp Antics (07 3393 3022) and ask her to add your name to the waiting list. She'll get back to you shortly to let you know when the class will be. I had a brilliant idea one night this week. It was one of those light bulb moments! You know the kind..... the ones that come just as you're drifting off to sleep. Normally when an idea like that hits I would reach over to jot it down in my Little Book of Big Ideas but four months after moving into our new house, we still don't have bedside tables and so my Little Book was not there. So I went over and over the idea in my head, working out every little detail hoping I might at least remember something about the idea come morning. 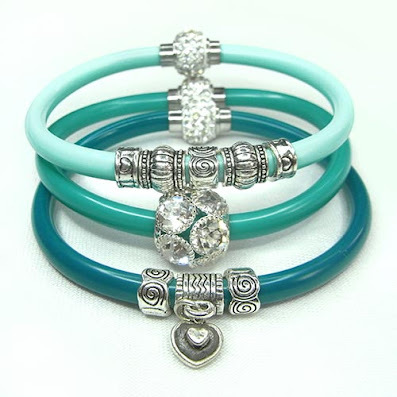 Do I start with a basic cylinder bead? Should I roll it into a ball? When should I add the stripes? Do I use the hot water method or stick with the heat gun...... so many questions. It's a wonder I got any sleep at all. So what was my brilliant idea, I hear you ask? Well, take a peek below! These are my first experiments.... you can just make out the beginnings of a swirl forming. Not bad, but I'm sure I can improve the technique. So I tried a completely different method for the second batch and got much better results.... a swirl is definitely happening here! That's much more like what I had in mind. 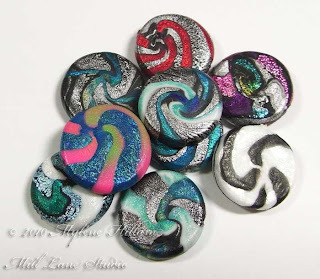 It's a similar effect to polymer clay swirl beads but it takes a totally different technique to achieve the effect in Friendly Plastic. 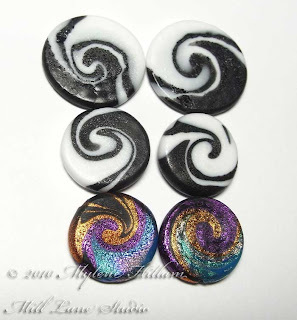 I'm calling them Swirl Beads because they look just like their polymer clay counterparts. As with most of the beads I make from Friendly Plastic these will get a coat of resin so that they can be turned into jewellery and then they'll be ready for my next jewellery project. I'm off to play some more with this technique so I have some finished pieces to share with you soon.